250g black glutinous rice, wash and rinse. soak over night. 1 liter of water or a bit more. 2 pandan leaves, tight in a knot. Soak the glutinous rice over night. Then rinse. Boil water, add the glutinous rice and pandan leave. Cook the glutinous rice until it becomes soft and kind of like porridge. Stirring occasionally. Add water if it becomes too thick. Add palm sugar, salt, and sugar. Mix until the palm sugar dissolved. Meanwhile, heat the coconut milk in a small pan with pandan leave until just boiling. Put aside. 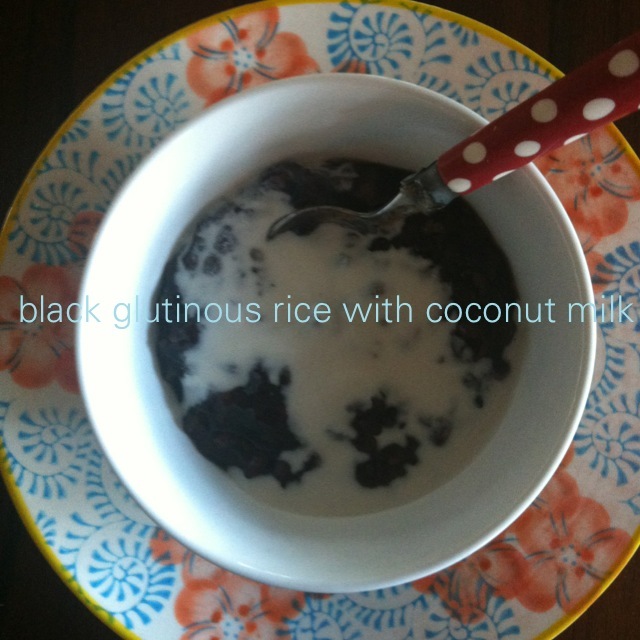 Serve the glutinous rice and pour a bit of coconut milk in every serve. It can be served warm or cold. Spring is in the air so that’s why I have loads of lemons! I have made lemon cupcakes, lemon pudding, lemon melting moments and lemon juice and….still end up with basket of lemons! 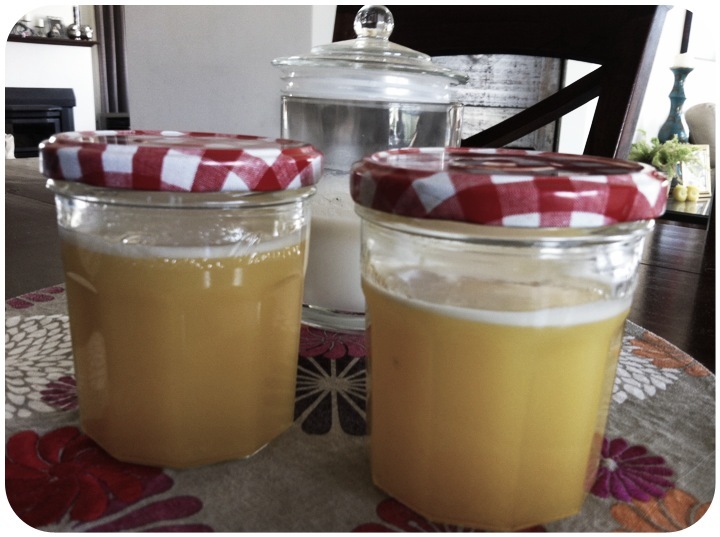 So, I made this lemon curd its good for filling for tarts, pastries and pancakes. It’s pretty easy to make too. Place butter, sugar, lemon rind and lemon juice in a heatproof bowl. Place bowl over a saucepan of simmering water, making sure the bowl doesn’t touch the water. Cook, stirring constantly with a wooden spoon, for 5 minutes or until sugar dissolves. Remove from heat. Whisk in eggs. Return to heat. Cook, stirring with a wooden spoon, for 8 minutes or until mixture thickens and coats the back of the spoon. Remove from heat. Set aside for 5 minutes to cool. Strain into hot, sterilized jars. Refrigerate for up to 1 month. This cheese dip is delicious with corn chips or for more healthy choice some cut celery sticks or carrots will be yummy too. It’s very nice to have it in winter time, rug up in front of telly, or when you’re having some friends over the bbq…. Heat oil in a large frying pan on high. Saute onion and garlic for 3-4 minutes, until tender. Add tomatoes and spinach. Cook, stirring for 1-2 minutes, until spinach has wilted. Reduce heat and add cream cheese, chilli sauce and chives to pan. Cook, stirring for 2 minutes until combined. Spooin into a serving bowl. Sprinkle with paprika and serve warm with corn chips. This sambal matah is the most popular sambals eaten in Bali and usually served with fresh grilled fish or fried chicken. It’s also a wonderful accompaniment to summer salad, grilled chicken and avocado. 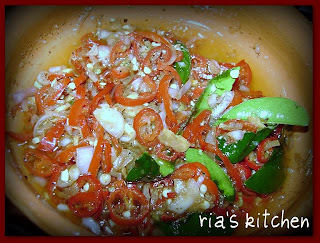 Slice the shallots as finely as possible, slice all chillies finely. Put all the ingredients in a bowl and mix thoroughly, making sure the shrimp paste is blended in. Add sea salt to taste. note: to grill the shrimp paste, place it on a small piece of foil in the oven or under a griller for 30 seconds until slightly browned. note: keep this savory sauce on hand as a dip for taco chips, a topping for scrambled eggs or an accompaniment for Tex Mex dishes. 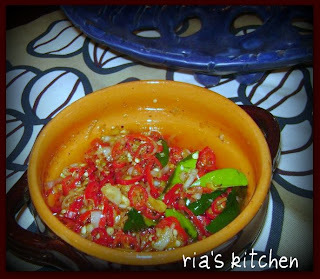 this salsa is good for eating with grilled fish, it’s so refreshing! cut mangoes & cucumber. cover and refrigerate til ready to use. combine juice lime, oil, sugar, parsley, salt & pepper – shake well then pour to mangoe mixture.